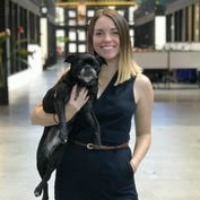 Rebecca Eyre is the Director of Communications for DogSpot, a Brooklyn-based startup on a mission to make cities better places to have a dog and be a dog. DogSpot makes high-tech dog houses, offering dog owners a safe, clean and comfortable place to leave their dogs when they have to run into venues that can’t allow dogs due to healthcode limitations. Rebecca has worked in operations and strategy across industries including healthcare, philanthropy, and marketing — but the uniting thread of her career is her desire to participate in movements aimed at making the world better. As a dog lover and urban dog mom, DogSpot’s mission is an easy one for her to get behind. Rebecca holds an MA in Psychology and is originally from Seattle, WA. She now lives in Brooklyn with her Boston Terrier-Pug mix named Mirabel.